The business magazine Bilan nominated TOLREMO therapeutics as one of the top 50 Swiss startups in which to invest in 2019. In a ceremonious event that took place at the Hotel Savoy in Lausanne, TOLREMO was selected as one of 4 companies in the Biotech category. For many solid tumors, treatments undergo a cycle: the drugs initially work well, the tumor shrinks, but then becomes resistant again. Stefanie Flückiger-Mangual, CEO of the Swiss biotech Tolremo, believes that this cycle can be stopped. The Swiss Venture Capital Report is the reference publication for investments in Swiss start-ups. TOLREMO’s rapid value generation and highly successful fundrasing rounds make the company stand out in the ecosystem. 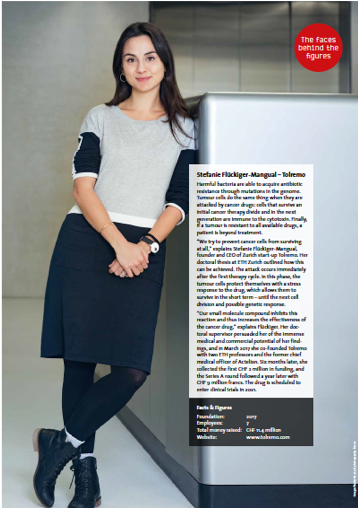 In the ‘faces behind the figures’ section, our CEO Stefanie Flückiger-Mangual talkes about TOLREMO and it’s rapid progression. We cordially invite you to join our session and look forward to meeting you there! The 24th Annual International Partnering Conference takes place from November 5th to 7th in beautiful Copenhagen. TOLREMO therapeutics will be present to meet with industry partners, expand business contacts and to gain insight into latest industry trends – feel free to get in touch (info@tolremo.com). See you soon at the Bella Center in Copenhagen! Dr. Stefanie Flückiger-Mangual, CEO & Co-founder of TOLREMO therapeutics, was invited to share her industry insights and experiences as female founder of a rapidly growing biotechnology company. Together with other entrepreneurs, the panel discussed the growing role of women in a predominantly men-dominated business and investor environment. The event was covered by the Swiss Startup News channel startupticker.ch. TOLREMO therapeutics was covered by BioCentury Innovations. In ‘Europe’s Piece of the Pie’ TOLREMO was named one of Europe’s top academic spinouts with disclosed financing. DUBLIN – For too many cancer patients, therapy still means no more than prolonging the inevitable. Cancer drug developers are proud to trot out numbers detailing objective response rates to novel drug candidates, along with progression-free survival and overall survival data. They're not shy about charging high prices for their product offerings either. But the grim reality is that five-year survival rates for many cancers – including lung, liver and esophageal – are still well below 50 percent, even if cancer death rates continue to decline in the U.S. and other high-income countries.